You know what to do if someone is having a heart attack, or you hear an intruder — call 911! But what about those other “emergencies” – the ones where you’re not sure who to call? Here are five home- (and sometimes life-) threatening emergencies that often baffle new homeowners. DON’T. THROW. WATER. It’ll only feed the fire. Instead, the National Fire Protection Association recommends smothering skillet flames by carefully sliding a lid over the pan and turning off the burner. Leave it covered until everything’s cool; removing the lid too quickly can allow the fire to spark back up. Maybe your yard is constantly soggy. Or you have no water pressure. Or your latest water bill seems awfully high. All can point to a water main break. Call your utility provider pronto. Get everyone out. Now. Do not pass go, do not grab your valuables; do not try to find the cause of it, or even call 911 (at least not yet). Some people say you should open windows first and even press “reset,” but the CDC (Centers for Disease Control) says to get the hell out. The risk justifies their advice. This deadly gas, which is colorless, odorless, and tasteless, will kill you. Full stop. If your gutters have dents and pings from hail, there’s a good chance your roof does too, even if you can’t see it. 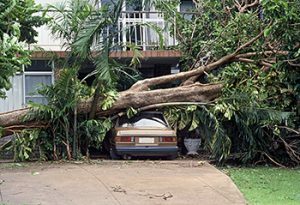 Call a roofer fast; and your insurance agent. Because if your roof is damaged, so are your neighbors’ roofs. Delaying could mean waiting months in line (giving leaks time to develop, causing even more damage) and could give cause for your insurance company to deny the claim.